Well my stack of bricks is , , a stack of bricks . 17" under the bumper and 12" under the cross member. So i added an air dam of 2.5", from a 90's full size Ford Bronco . This was 3" short . So I simply cut it in hafe, spread the parts and bolted it through stock and drilled holes in the bottom of the bumper. To cover the missing pice I moved the licence plate to the lower holes . This was going to work out . Liked what I saw except the suspension and cros mimber hang down below my new addition. To the head($0.35 ea Vs$1.65 for pre threded) for a full thred to be able to clamp at both ends of the bolt (1 nut securing the bolt to the bottom of the bumper and 3 nuts holding the air dam) and delete the need for a spacer/shim. So I set this with the center 5" (2.5"+the 2.5" of the doner part)to the bottom of the lowered licence plate . For 2 reasons 1 I was lazy and didn't want to make a filler to support the center (were I spred width) 2 this made it to were the only part hanging down below the air dam in the middle was the oil drain plug. On the corners I set the air dam down to 7"( 4.5" bolt+2.5"). This angled profile came to the bottom of the lower control arms. Now I was planning this out as I went . I had som 1/8" paneling that I was going to make a flushed out filler going from the crome to the now lowered air dam. Cover the panel with paint and it would survive for an extended period of time. But then concitered that I wanted to runn the air dam at several different hights, this would require a sophisticated curved structure to be built for each version. And decided to test the durability of a quick prototype material. Self adhesive shrink wrap tape 6" wide. 6" wide by 180' long heat shrink tape. 9mil-backed tape with no UV inhibitors. Heat shrink tape is designed to tape seams, patch holes and secure zipper access doors. Available in white, blue and clear. I installed the tape even with the bottom of the Ford part. And set the remander as high up the bumper as I could wile maintaining a wrinkle free application ( using heat from an iorn for skin skinning a modle airplane($5 pawn shop) strategically to shrink pleets that apply flat on a curve) . Apply heat with verious methods . Propain torch, 1500w heat gun, the skinning iron. It helps to practice on sone to learn your technique. But I said quick and dirty right. So out with the tools . Start with kiss, No cords let there be light of fire. The pencle tip style torch head concentrated too much heat too small. Eather to fast to activate the shrinkage or to hot and melt, drat. My goldy lox wasn't happy so I try the other tip with a spred 3 fingerd flame a little better . This stuff is thinner than what I used on my Aero Tonto. and that makes it more finicky. It will shrink just with fire, just more time required to reach an acquit levle of mastery than I want to invest at this time. Next the modle skinning tool. However now that I find a pic of one it shows a sock /slipper pad that would have helped (I'll have to try that) this tool did get hot enough, however the plastic would get slightly tacky and strech funcky. Agen more time /skill /knolage needed. On to the tryed and true hot air gun. The one I have is a digital-+5°f settable. I started at about 250°f and worked my way up to were the plastic was behaving it self, pulling tight not pulling too tight and creating a hole. . This worked. As you can see the arbitrary drop was just right. Off to the mountains to test with the go pro and make shure it is stable at speed . A warm up route takes me through 25 , 35, 45, 55, 80mph zones and 15-20 mi to the top of a grade. Were I gravity drop from 65mph down a 6% 3mi grade. Lost a small amount of speed 80mph vs 85mph w/o. 3 runs down ea. ( only bolts hanging for A2 test) . Back to the house and try V2 . Same as the first but diffrent. This time I wanted to see if It (with the life I live)could handle going lower?. Skip forward no I can't except this. To extend the air dam down I simply added long(2" cupler) nuts with a nylock jam nut ,to the bolts alredy installed. And some 3/4" long bolts from the bottom. This time the tape is not wide enough, 1.5" short. So 1 layer/1/2" on the lower plastic and up to about(+-1/2") the same place on the bumper. Shrink this. 2nd layr is alined with the bottom of the black plastic and shrank. Quick and dirty. Some notes on layering.... air bubbles are horable avoid them. As you heat to shrink the air expands streching/growing till you stop Appling heat. Then the shrink wrap cools faster than tbe air harding as a lump. ****ion was to work the bubbles to an edge to get them out . Some were bonded in bad or to far from an edg so I poked the air bubbles with a needle. Wala nice and smooth. Kind of like Appling decals. Low + backwoods dont go together. This is my alternative rout to 80mph Interstate it a "drover road"(means unmaintained cattle drive road). I did manage to hook the unsuported section on some rebar poking out of a parking block. Ran this way for a wile. (Jun -Sept.) Knew it was negative mpg but you dont know what you havd your hands around till you do distructive testing I mean this is tape how strong is it ? Can it take a rock at 70mph ? 100mph+ air speed? (Don't kid your self even Ecomodders brake 100mph air speed 55mph road speed + headwinds of over 50= over 105mph ) well it sustained 70mph +50mph head wind with gusts to70mph so 140ish. hundreds of dirt road miles with a few ground strikes (in this lowest ppsition it was 2"below the drain plug) a cupple hard strikes in driveways (some of the same places my Aunt hits inher hybrid) and 3/4 of a trip to the west desert of Utah. The overgrown sage brush(wetter than average year resulting in biger than normal growth ) and a cupple ground strikes broke 3 of the 5 bolts on the passanger side hafe. It was still atached by the shrink wrap tape and 2 bolts. They sheared off from work hardening. (Haveing been bent and straightened many times. Whis was 2 weeks before Darco. So when I got to town I re set It to my desired height 2"center and 5" on the corners. At Darco Aerohead, Freebeard, and I learned that the operator of the wind tunnel had yet to see an air dam that actualy reduced CdA. Lance has tested many prototypes that were on there way to Bonneville for Land Speed racing record attempts. S hear is the data its only a/b but it is empirical data. DISCLAIMER the difference between the two tests is accurate, HOWEVER the Total Cd value is skued high due to tunnel wa interference.. So in the end I am not running an air dam. Coefficient of drag down, Aera up at equal percentages will net a zero change. In my cace I changed the A from a poor flow open suspension, to no flow solidthis increeced the frontal aera. As well as I went the same size as the bumper... yhis wound up 4"widerthan the tires. And what the broken off part looked like. Hears one I scalped from a car lot gave me some ideas. A Toyota Tacoma pickup. they (Toyotas aero team)solved some of my problems . 1 they taper up on tbe corners. 3 they kept it low full with to and used the center section as an intake duct for cooling. The air dam has a crease running horizontally were the loical stall poit is located(the point that the air has to go up and around or down and under). Setting the air dam back and under like this will cause lift as the air( being pushed like a snow plow) builds high presure on the under side of this bumper. There is alredy low pressure at the front of the hood were the air separates at the transition to horizontal flow. Last edited by gumby79; 12-02-2017 at 08:21 PM.. Reason: Fix mixed up pictures. Thanks for posting your results. Even if they made the overall outcome worse. I wonder if the air damn was simply too aggressive? 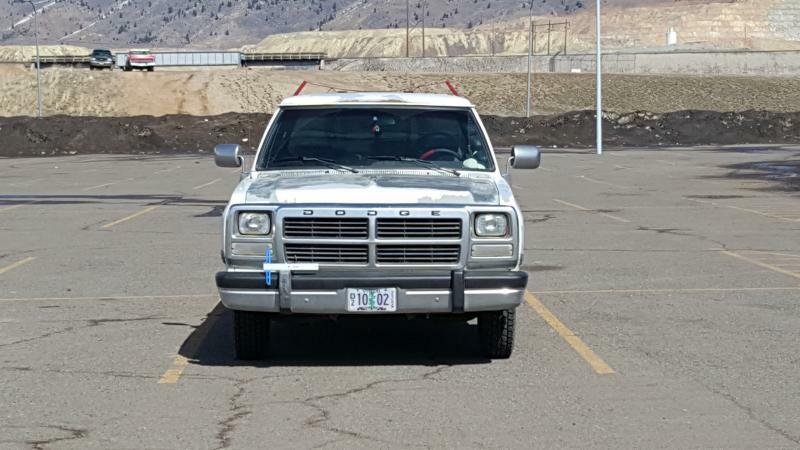 As much as I really like your stand off bolts, if you simply mounted the bronco air dam to the bumper of the dodge w/o your stand off extenders if your results would be better. I don't understand why the Toyota leaves soo much tire exposed. One of the problem areas of my 2nd gen Dodge Ram I hope to address. I know you like this tape. Coefficient of drag down, Aera up at equal percentages will net a zero change. I had to read that a few times. Was there there a squiggle under 'Aera'? Why 2" below the lowest point? How many inches from the bottom of the drain plug to where 90% of the oil pan/crossmember is occluded? I suspect eventually wheel spats will be like the 'venetian blind' style of Formula 1 front dive planes, turned 90°. The air dam on my Accord (and one that I tried on my Forester) were marine wrap. It would undoubtedly look better with shrink tape. Having the grill completely blocked off was great for the first 75 miles or so, but then I started hitting hills. Right now it seems like the easiest route is to completely cover the lower grill and put a fire blanket over my engine for the first fifty miles, but needing to stop just for that does not sound like a great plan. Too aggressive? Yes . In my opinion especially without having a belly pan in the front section between the air dam and the crossmember. The air dam was the same width as the bumper. The bumper sticks 3 in past the sheet metal which sticks 3 inches past the tire for a total of 12 inch wider than the tread of the tires. More ideal would be like the Toyota pictures. Inset on the corners 1/3 Tire width and raised slightly as the Toyota was done for approach angle while dropping a tire in a rut / curb slash driveway. Yes rats I have to deal with in Montana as we have more miles of dirt road than paved Road and let's face it you can't go play in the woods if you can't drive on dirt roads for Street only minding approach angles you may be able to go straight down in front of the tire. The 5 inch drop in the center was chosen as this is the bottom of the lower crossmember under the engine the 7 inch drop on the corners was chosen as this is the lower control arm height. Coefficient of drag down, Aera(Area) up at equal percentages will net a zero change. No squiggle Android doesn't believe in spell check and my dyslexia prohibits me from Catching it myself. Apologies. 0:0 to the lowest point of structure half an inch above my oil drain pan plug. Yes the total package will work together , when properly designed , however in this case we tested with the Tonto cover installed in both instances so this design did not work with my other Aero modifications . no test was run with the air damVs stock. The one you tried on your Forester sure was neat I think a beach ball would have been a really good bow break shape. I used the industrial 12mill self-extinguishing version shrink wrap on my Aero Toronto prototype. V2 will get Ortex destructive testing.This tape is meant to be a peel off protective barrier when it is applying a super sticky adhesive that will damage paint like gluing the edge of your shrink wrap to your fenders and Hood to get a very smooth transition to the existing shape. At the wind tunnel I used this to fill the gap between the headache rack and the back of the cab, cab to bed Gap, and fill the discrepancy caused by a design attribute in my Aero Tonto to accommodate in removable rear section of a ladder rack , that I will not be including on version 2. I pick this stuff up last winter and used two pieces over my grill cut to shape nice and neat, much better than the blue foam I had in the upper holes. I try painting the fome and now they resemble a cinder block with all the little holes just a lot lighter than cement. No pics sorry of that. With this whale of a truck I found blocking the radiator with cardboard between the intercooler and the radiator to be more effective at retaining operating temperatures especially in eco mode .stock143-175°f maxVs 100%grill 160--181° ,60% radiator only 175 -192°. I added a panel to fill the open Passage that lead from the opening between the bumper and the body out to the ground between the frame rails with this panel installed and 100% grow block air is forced between the body panel and the bumper and this forms a duct that flows through the front of the radiator bypassing the intercooler increasing my intake air temperatures yet keeping the engine cold according to Cummins for every one degree you raised intake air temperature there is a corresponding 3 degree increase in exhaust temperature on a diesel engine. The downside only the lower portion of the radiators actually cooling the engine the upper section is in stagnant air being warmed by the intercooler and the refrigerant compressor in defrost mode as well as the transmission liquid to air cooler this causes unnecessary activation of the mechanical fan clutch at temperatures lower than the thermostat opens. According to literature from Cummins the fans bolted to their Motors pull anywhere from 25 to 75 horsepower mine is on the 25 or 25 to 35 horsepower range the 25 is more like the 4bt 4 cylinder. 6" shrink wrap tape, long turm testing. I did a failure mode test on shrink wrap tape. . The tape is not UV stabilized . minor UV checks (~1/16-3/32" long). Adhesive holding strong. If this was in freespan, such as the air dam, would it have failed? Possibly, as a double layer like I used, in the air dam, at this point the UV would start compromising the second layer underneath these cracks small and slow but starting.